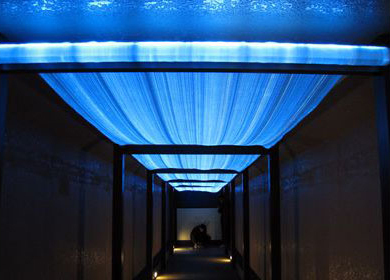 Delight Cloth consists of super thin fiber optic strands woven into a tapestry. You’ll need to connect a 100W or 150W halogen to one or both ends of the fabric “depending on what effect you want to achieve. You can even add a color controller and get a variety of colors, and yes, the technology can be integrated into clothing (though no word on where you hide the light bulbs)” (Source: ubergizmo). Although I believe Delight Cloth is not really a portable or wearable but it is a perfect solution for interior decoration. Interior designer will now be able to create unique environments by integrating soft flexible light in ways never thought of before. This product gets me excited & thinking. I imagine the ability to stream video or animations through the flexible fiber optics textile, creating graphic sustainable textiles. + Delight Cloth by Lumen click here. This looks very space age! Because of the fiber optics, I bet it is a lot cheaper to run than other lighting sources. I found similar product called luminex!